Imagine this, you’ve just finished the first nine and you scored really well. The second nine wraps up and it was a complete drop-off. It happens. Have you ever wondered why? It might not be the reason you’re thinking and there is a solution. Most people think of hamburgers, hot dogs, and French fries when we think of golf and that’s fine when you finish, but catching a quick burger and fries on the turn may be a contributing factor as to why you played poorly on the back nine. 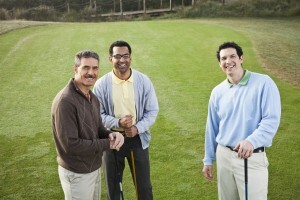 There is a reason that tour players carry snacks and eat them frequently during a round of golf. When asked what they snack on, most of them had similar answers. Below is a list of the best snacks to eat on the course during a round of golf that will keep your energy levels up and help with focus and concentration. Fresh Fruit –Apples, grapes, oranges, pears, bananas, etc. Dark chocolate – A great option to provide some mental stimulation and healthy fat. Make sure you stick to a high quality brand with very minimal ingredients and no less than 70% cocoa, otherwise it will contain too much sugar. With coffee, there’s too much caffeine and juices and soda have too much sugar. Worst than both of those are energy drinks / bars because of the combination of too much caffeine and sugar! If you’re having a bad round, you may want alcohol / beer but that’s best to held off until the 19th hole. It’s a sedative and (unfortunately) will affect your coordination. At the end of the day, I can suggest all of the healthy options in the world for your round, but many of these will require some prep time prior to your round. So, the second step to eating healthy snacks for your round of golf is coming to terms with the fact that you will have to think about what you will bring with you prior to leaving the house. That’s right everyone, no more rolling out of bed 10 minutes before you have to leave (well unless you prepared your snacks the night before). Trust me, the simple fact that you will feel better on the course and have a chance to improve your score will be worth the prep time. PreviousWhy Should Your Kids Learn the Game of Golf?